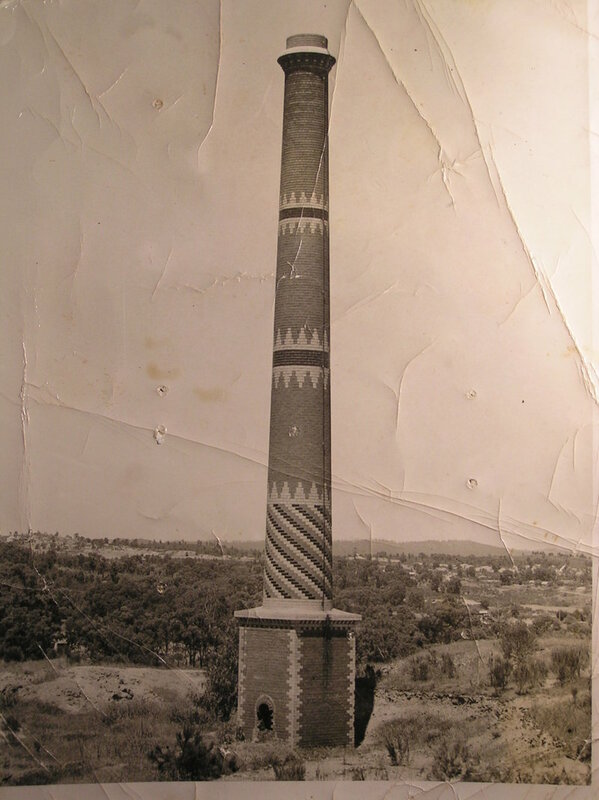 Above: Mine chimney constructed on the Victorian goldfields by Joseph Pickles. This chimney at the "Red, White and Blue Mine" was decorated with red, white and blue bricks! On the 16th of September, 1854 my Great-great-great Grandfather Joseph Pickles departed from Merseyside on the White Star Line Clipper "Sultana" on a three month voyage which would eventually end in the Hobson Bay in the Port Philip District of Victoria. One of the reasons why I know this information is that he kept a diary of the voyage. 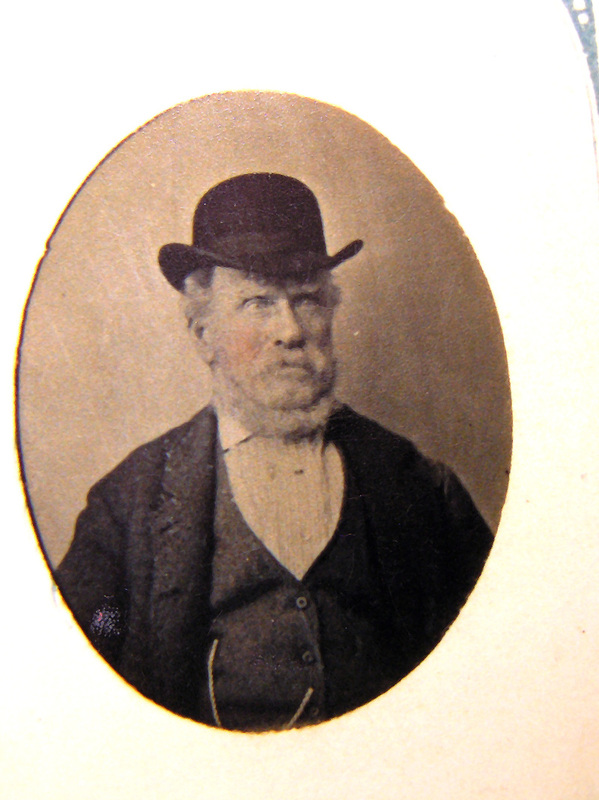 Although he came from a relatively poor family in the Hunslet region of Leeds, during the early-mid 19th century young children received a basic education (by the age of 14-15 they are usually employed in the local mill industry). Hunslet and the neighbouring regions of Holbeck and Beeston where early industrial centres largely clothing mills, but also brickworks. In the 1841 census Joseph occupation is listed as "bricklayer", other occupations of his neighbours are listed as "cloth weaver, cloth spinner, clothier and cloth draper". Although I have a large collection of cookbooks form this period, these are for middle- to upper-class English households, ironically I know more about the food habits of total strangers then my own family. Poor families don't write cookbooks. Happily one of Joseph's interests on the voyage to Australia was with the ship's food. In fact he wrote a poem about how much he disliked it. "...Then now comes Friday: What's the dish? A pleasant article of food. That it will scarcely bide a touch…"
There are many similar verses on his views of the various meals on board the ship (beef and duff, pork and peas, beef and pudding, boiled rice, salt fish and preserved potatoes, ships biscuit and butter, tea and coffee). Joseph's preoccupation with his dislike of ships food resulted in his writing a list of "Useful things to bring with them" for his wife who was to travel to Australia a few years later with their young sons. About 2 stone of parafin and about 6 stone of flour and about 1 stone of beef cut rendered and put in jars, and 6 pots of preserves and 1/2 stone of lump sugar and 2 lb of carbonate of soda and a few pounds of currents and about a pound of carryway seeds and a little ginger and a stone of oatmeal, and a little ham and a few pounds of bacon and a few nutmegs, and dont forget a little medicine and oatcake it is very good when it is well dryed before it is put in the box and kept airtight and a bit of common cheese that is well dryed. The best cheese will not keep at sea and a little fresh butter well salted in a jar and a thin cloth over and well covered with rough salt, and a few scores of potatoes. I should recommend you have a box lined with tin with a partition in to keep the things parted. Although this list of items can only provide a rough sketch of the food that my English ancestors ate (there is no fresh food on a voyage for instance), it does offer some insights. Carbonate of soda seems to be in regular use as a raising agent and much to my surprise, a relatively expensive spices are being used (possible in boiled puddings or "duff" to be eaten with the meat). However one item that is of great interest is the Yorkshire "oatcakes". 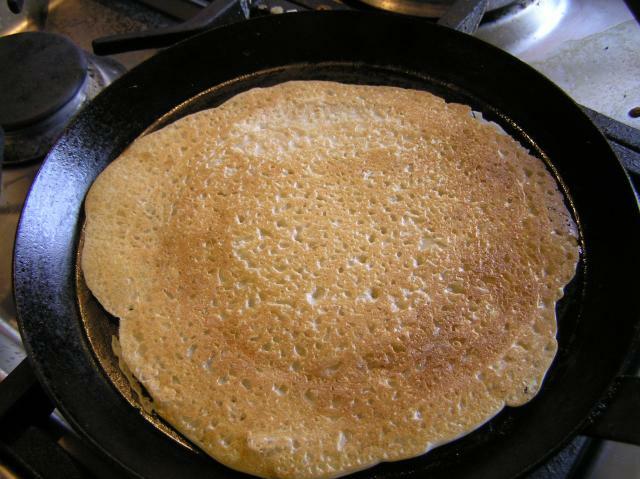 The West Riding of Yorkshire, and neighbouring regions in Lancashire, have a long association with oatcakes. In part this is due to the fact that wheat was not a traditional grain grown in these regions and its introduction to the region occured relatively late (early-mid 19th century) compared to other parts of England. 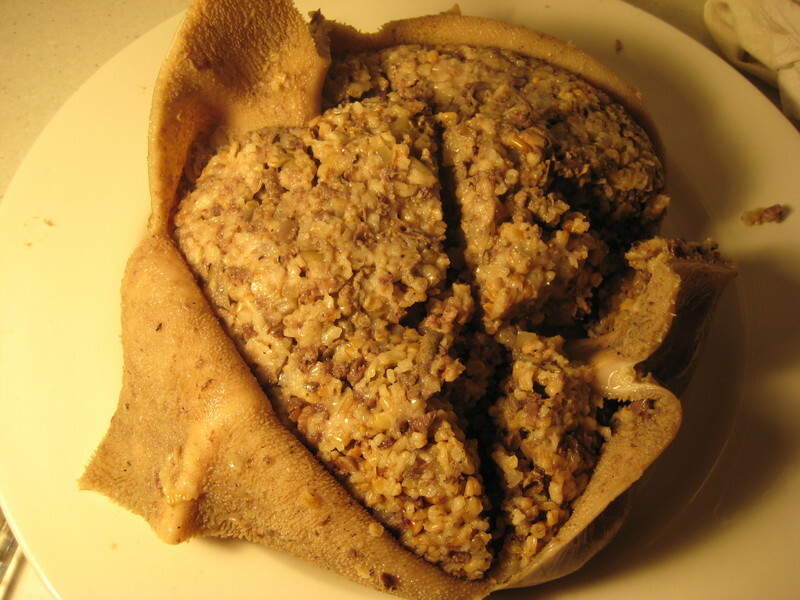 "Riddle cakes, said to be thick sour cakes and is mostly eaten with tea, being preferred to wheaten bread. The Lancashire oat-bread is made both leavened and unleavened (in refutation of Adam Smith) says handsomer and more muscular men are not reared in any part of the British dominions, than in those countries where the oatmeal diet is predominant. The 33rd regiment, which goes by the name of ' the Havercake Lads,' and which is usually recruited in those parts of the West Riding of Yorkshire where oat-bread is in common use." Most people now are familar enough with small thin and crisp Scottish oatcakes, however there was a large variety of oatcakes or "haverbread" ("haver" is of Anglo-Saxon/germanic origin and means "oats", hence "Haversack" or oat bag) made throught the UK. The majority of these oatcakes are no longer made, however there is a large amount of information about the types historical oatcakes made in Yorkshire, Cumbria and Lancashire. 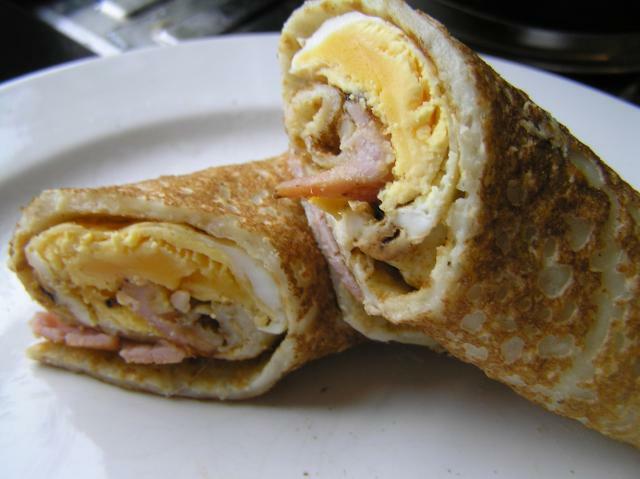 In fact soft Staffordshire Oatcake are still made. There are two main types of oatcake made, the first is made from a stiff dough rolled out and baked until stiff (like a modern Scottish oatcake), called clapbread, oatcake or haverbread/cake. The second type is made from a thin batter which is poured out onto a griddle or "bakstone" (bake stone) and cooked like a large crepe, also known as riddlebread, haverbread/cake or oatcakes. 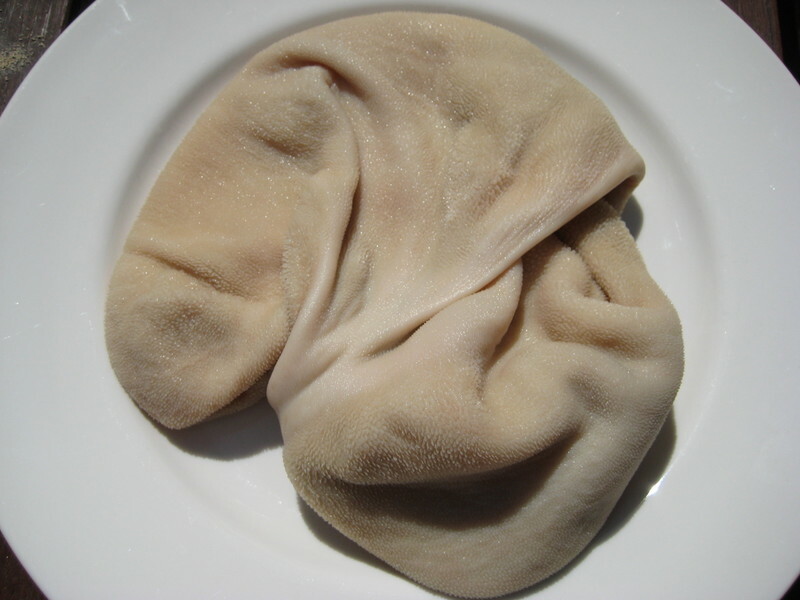 This latter type can eaten fresh when soft (like a modern Staffordshire oatcake) or they could be dried for future use - which is the form that Joseph refers to. 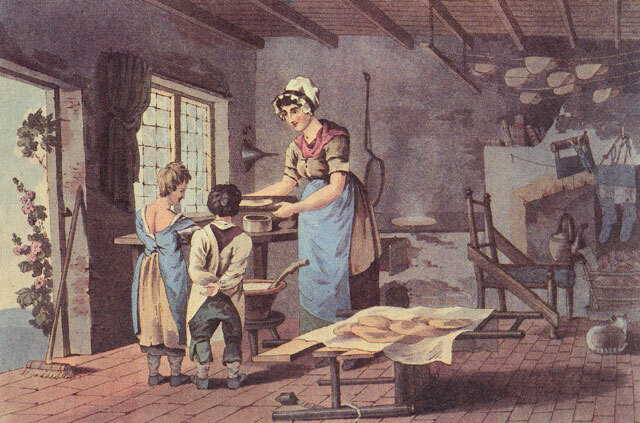 This process of producing soft oatcakes and drying them is shown in this print from "The Costume of Yorkshire" by George Walker 1814, note oatcakes being hung from the ceiling to dry. I have produced these soft oatcakes from a recipe given in Elizabeth David's "English Bread and Yeast Cookery", based on the recipe given for Staffordshire oatcakes. Essentially equal amounts of oatmeal and wheat flour are added together, a thin batter is made using a warm water and milk and a little yeast is added. Historically, no wheat flour would have been used and the yeast would have been replaced by the leaven produced by allowing oatmeal mixture to sour. Nevertheless, I found the modern version to be delicious an much appreciated by my young son. They are equally good spread with butter and honey or filled with egg and bacon. 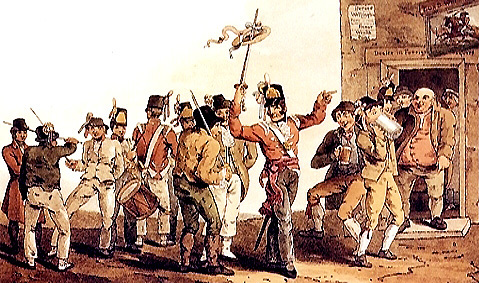 Above": Recruiting for the "Haverbread Lads" (33rd Regiment). Note the recruiting officer hold aloft a haverbread, decked with ribbons. This year I recieved numerous tins of shortbread for Christmas (I feel that this ia a sign of age, like presents of socks and jars of nuts), which is fine as I quite like shortbread. One brand of Scottish shortbread that I really like is Walkers of Aberlour. While I like their style of slightly salty, not too sweet and butter shortbread, another thing that I really love about Walkers shortbread is the tins themselves. In a period where the theme seems to be a jaded and cynical world-weariness, there is just something innocent, simple and non-ironic about a shiney tartan clad tin of Scottish shortbread. Prehaps the most famous design for Walkers is their "Flora Macdonald" range which depicts the late 19th century painting "Prince Charles Edward Stuart Bids Farewell to Flora Macdonald Who Aided His Escape" by George William Joy. This historical and romantic style of artwork depicting Scottish (or at least Highland) history on shortbread tins is so well known that any overly sentimental views on Scotland are often described as "Shortbread tin Scotland". In this particular case the image shows "Bonnie Prince Charlie" (Charles Edward Stuart, grandson of the deposed James II & VII) taking his leave from Flora MacDonald, who aided his escape from Scotland after the Battle of Culloden, the final confrontation in the failed Jacobite Raising of 1745-46. After 1746 Bonnie Prince Charlie spent the rest of his life in exile in Europe, finally dying in 1788. During this exile period he became shunned by the courts of Europe and was known as a wife-beater and drunkard. However, such was the interest in period of Scottish and English history, that the image of the young, handsome and charismatic "Bonnie Prince Charlie" has become an icon overly-sentimental Scottishness and many, if not most people, know him as "that chap on the Shortbread tin". From the household account book of James Gib, Master of the Household/Butler of Charles Edward Stuart, as recored by Bishop Robert Forbes (publised as "Jacobite Memoirs of the Rebellion of 1745" in the 19th century). To 2 Cakes Short Bread . To on Sallmon Pastie . .
To on Plain Custard . To Short Bread . .
To on Custard . . .
To on Side Cake . .
To on Custard . .
To on Weilldfoull Passtie . March ye 30th, To 2 Kaiks short Bread . Take a peck of Flour, put three lb of Butter in amoung a little water, and let it melt, pout it in amoung your Flour, put in a Mutchkin of good Barm; when it is wrought divide it in three parts, roll out you cakes longer then broad, and gather from the sides with your Finger, cut down the Middle and job it on Top, then send it to the oven. 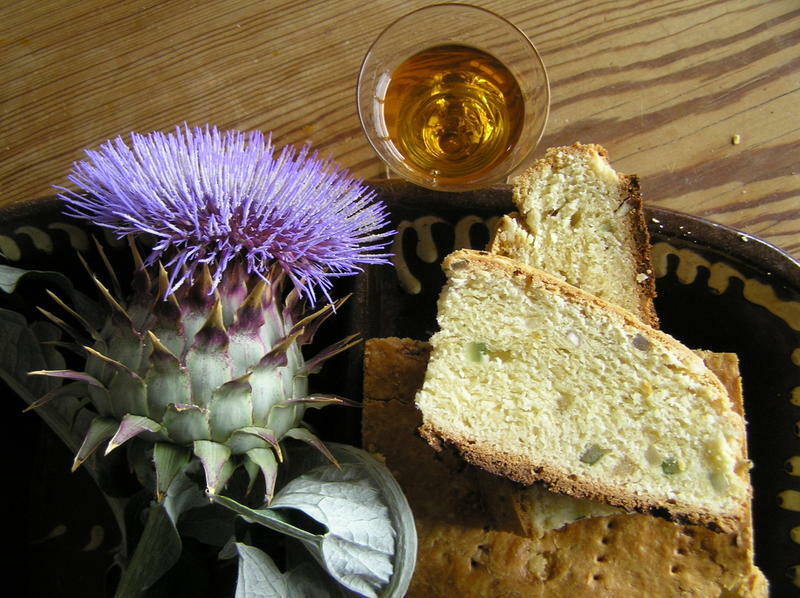 Above: 18th century Scottish Shortbread, based the recipes posted here, whisky and a thistle - very shortbread tin Scottish!. Take a Peck of Flour, make a Hole in the Middle, melt three pounds of good Butter in a Mutchkin of Barm, put Carraway or what dry Sweet-meats you please in the Flour; then pour in your Butter and Barm, work it well with your Hands, and if too dry, put in a little warm Water; when it is well worked, roll it out in Cakes of what Shape you please. Prick with a Fork, and bake it on floured Papers. Take a Peck of flour, and four pounds of butter English, or three pounds Scots weight; put the butter on to come a-boil; make a hole in the flour, and pour the boiling butter in it; work the flour and butter a little while together; pour in a mutchkin of good yeast amongst the paste; work it together, but not too much; divide the paste, and roll it out oval; then cut through the middle, and plait it at the ends; keep out a little of the flour to work out the bread; flour gray paper, and fire the bread on it: if you make it sweet, allow a pound of sugar to the peck of flour at least; if you want it very rich, put in citron, orange-peel, and almonds, strew white carvy on the top; be sure to mix the sugar and the fruit with the flour before you wet it; remember to prick it well on top. After Mrs MacIver's death here business partner, Mrs Fraser published the following recipe (in "The practice of Cookery: Pastry, Confectionary, Pickling, Presering &C", 1795) in the 1820 edition of her work. Take a peck of flour, keeping out about a pound to work it up; beat and sift a pound of sugar; take orange-peel, citron, and blanched almonds, of each half a pound, cut in pretty long thin pieces: mix these well in the flour; then make a hole in the middle of the flour, put in three pounds of melted butter, with a table-spoonful of good yeast; then work it up, but not too much; divide it into eight cakes, and roll them Out; prickle them on the top, pinch them neatly round the edges, and strew sugar, carraways, peel, and citron, on the top.— Fire it on paper, dusted with flour, in a moderate oven. spice pounded, and mix them with the flour; when the butter is melted pour the milk and butter in the middle of the flour, and work it up like paste; pour in with the milk and butter half a pint of good ale yeast, let it before the fire to rise before it goes to the oven; put in two ounces of carraway-seeds, put it in a hoop, and bake it in a quick oven. However, during the early part of the 19th century they use of yeast in Scottish shortbread was abandoned. During this period we find interesting transition recipe which are identical the the earlier yeast raised "Short bread" in all details apart from the use of yeast! From Mrs Margaret Dods' (Isobel Christian Johnston) "The Cook and Housewife's Manual" 1826. To the fourth of a peck of flour, take six ounces of sifted sugar, and of candied citron, orange-peel, and blanched almonds, two ounces each. Cut these in rather long slices, and mix them with the flour. Rub down among the flour a pound of butter in very small bits, melt a half-pound more, and with this work up the flour, &c. The less kneading it gets the more short and crisp the cakes will be. Roll out the paste lightly into a large well-shaped oval cake, about an inch thick, and divide this the narrow way, so as to have two cakes somewhat the shape of a Gothic arch. Pinch the cakes neatly at the edges, and dab them on the top with the instrument, the dabber, used for the purpose, or with a fork. Strew caraway-comfits over the top, and a few strips of citron-peel. Bake on paper, rubbed with flour. The cakes may be squares, or oblong figures.—Ob. Plainer shortbread may be made by using less butter and no candied peel. The whole of the butter may be melted, which makes the process easier. Chopped almonds, and butter, are used in larger quantity for very rich shortbread. By the mid-19th century, the use of yeast in shortbread recipes had been abandoned and the use of candied fruits, comfits and almonds had also been reduced or abandoned and essentially we have recipes for modern shortbread. It was during this period and the decades shortly after that many of the now well know shortbread producers were founded (Walkers was established in 1898). Bonnie Prince Charlie may now be linked with shortbread, but he more then likely would not have recognised the product that we know see as being typically Scottish. "There was a very long table loaded with a great variety of dishes, some of the most luxurious, others of the plainest—nay, coarsest kind : these were very oddly arranged; at the head were all the dainties of the season, well dressed and neatly sent in ; about the middle appeared good substantial dishes, roasted mutton, plain pudding and such like. At the bottom coarse pieces of beef, sheeps' heads, haggiss, and other national but inelegant dishes, were served in a slovenly manner in great pewter platters; at the head of the table were placed guests of distinction, to whom alone the dainties were offered ; the middle was occupied by gentlemen of his own tribe, who well knew their allotment, and were satisfied with the share assigned to them. At the foot of the table sat hungry retainers, the younger sons of younger brothers, who had at some remote period branched out from the family ; for which reason he always addressed them by the title of “cousin”. This, and a place, however low, at his table, so flattered these hopeless hangers-on, that they were as ready to do Lovat's bidding " in the earth or in the air" as the spirits are to obey the command of Prospero"
We should also keep in mind that the haggis of this period were in fact quite different to those of today. If we look at archetypal haggis recipe from the 18th century, this difference isn't at first obvious; in fact the ingredients are still quite typical of a "modern" haggis. Make the haggis-bag perfectly clean, parboil the draught ; boil the liver very well, so as it will grate ; dry the meal before the fire ; mince the draught and a pretty large piece of beef very small ; grate about half of the liver ; mince plenty of the suet and some onions small ; mix all these materials very well together, with a handful or two of the dried meal ; spread them on the table, and season them properly with salt and mixed spices ; take any of the scraps of beef that are left from mincing, and some of the water that boiled the draught, and make about a choppin of good stock of it ; then put all the haggis meat into the bag, and that broth in it ; then sew up the bag : but be sure to put out all the wind before you sew it quite close. If you think the bag is thin, you may put it in a cloth. If it is a large haggis, it will take at least two hours' boiling. In fact the only real difference is the "haggis" itself. Confused? Well I guess it is very confusing unless you realise that "haggis" originally refered to both the sheeps rumen which was used as a casing for the pudding and to the finished pudding itself. Now that haggis are rarely made in a sheep's rumen, we only retain the latter sense of the word. 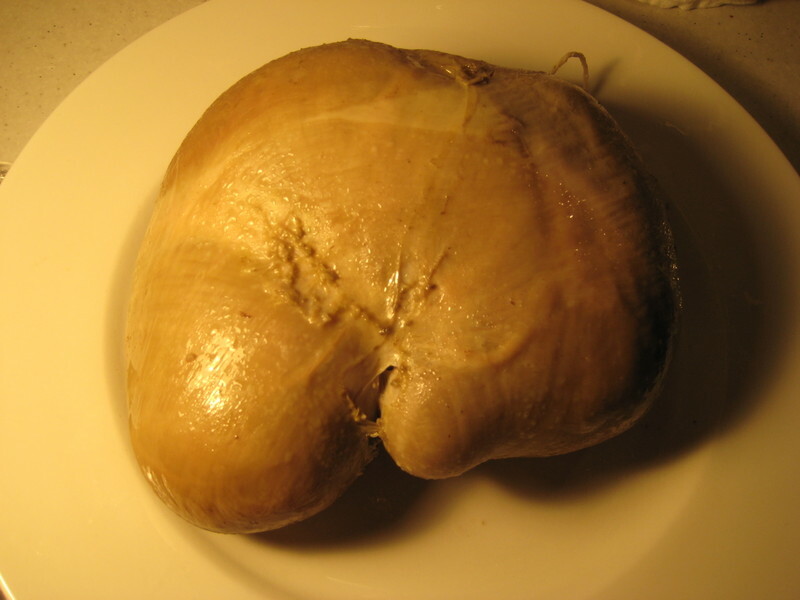 Modern haggis are usually stuffed into bovine caecum or artificial casings. Part of the reason for this is that a rumen from an adult sheep is quite large with a total volume of 5-7 litres. This makes a huge pudding, something to feed a very large group of people with. Another reason is that the rumen has quite a distictive aroma, a cleaned bovine caecum or artifical casing doesn't. Part of the irony of this is that many, many of these modern haggis are eaten specifically for Burns Night suppers in which a poem describing the old syle and quite different type of haggis is read. In fact much of the poem doesn't make sense unless you are familar with the old style, offal boiled in a rumen, haggis. Before I move on to the poem, let me just make it quite clear that I do in fact love the modern style haggis, be it deconstructed, sanitized and reformed into a ziggurat on white bistro plates or battered and deep-fried from a chip shop. The poem in question is obviously Robert Burns' "Address to a Haggis". Writing at the end of the 18th century in a period when Scots were creating a modern national identity, Burns was able to provide a robust, yet romantic ideal of Scottishness which was accessible to most Scots. So popular was Burns as poet, that shortly after his death "Burns Clubs" were formed. To this day the his birthday (25th of January) is celebrated as a national day in Scotland. On this "Burns Night" haggis are consumed in great numbers and his famous "Address to a Haggis"'is read. 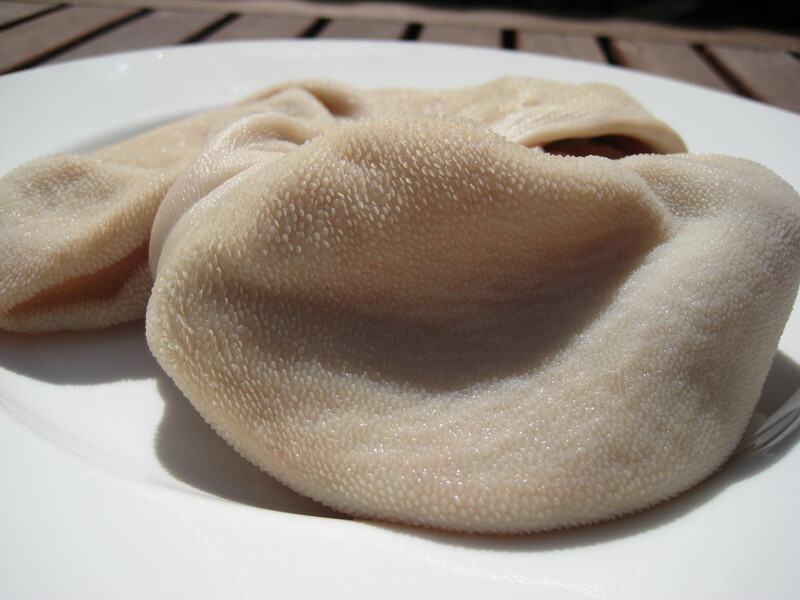 Above: The cleaned sheep rumen. Above: The ingredients for the haggis stuffing. 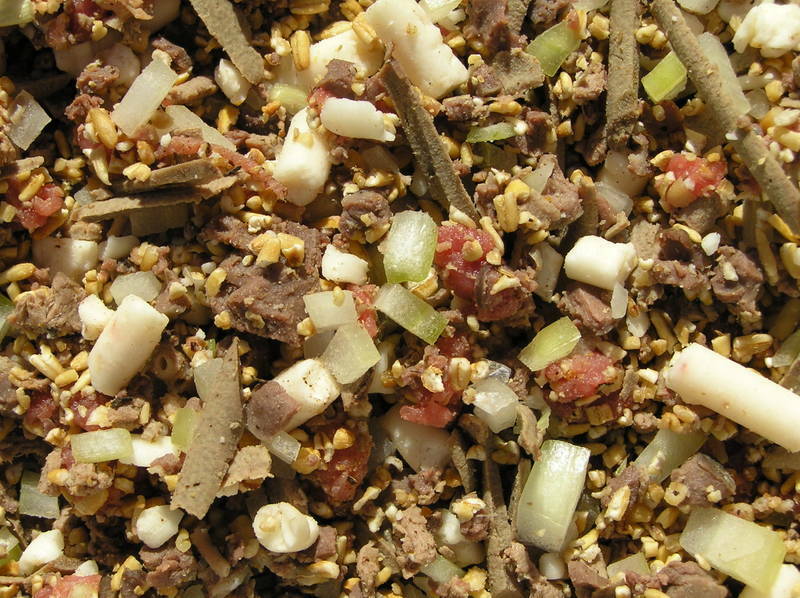 Offal, suet, beef, oats, onions and spice. Above: The image that helped make the first part of the poem make sense. Obviously a lot of this part of the poem is about the size of the haggis, as discussed above a haggis from a full grown sheep is going to be huge, absolutely as long as an arm and about to fill a trencher to over-flowing. "Hurdies" can be translated as "buttocks" and as you can see, due to the bi-lobed nature of the rumen, with a bit of imagination you can see some "hurdies like a distant hill". Difficult to see in this image, but some of the melted suet does indeed seep through to the surface of the rumen and has absorbed pigments from offal, these are the "amber beads". 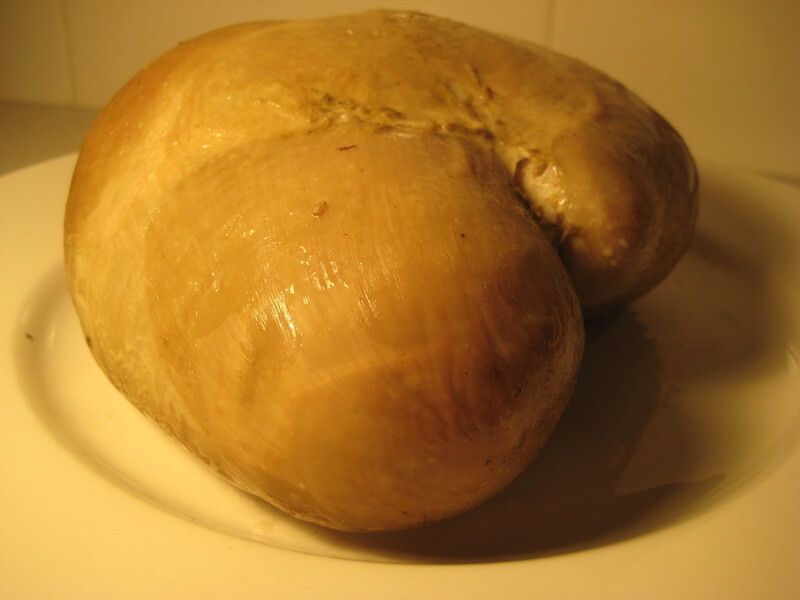 Above: Another view of the haggis, showing the bulging, bi-lobed rumen. 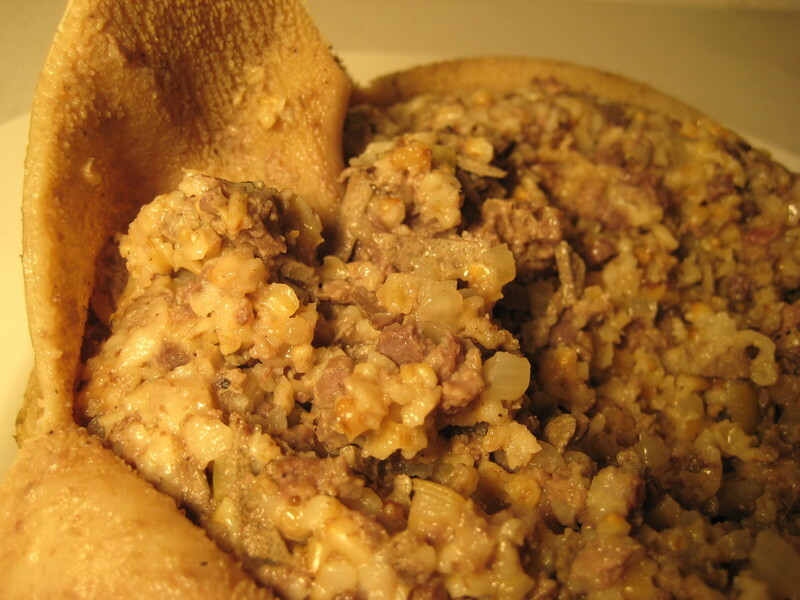 Above: The haggis cut open to show the interior (the "gushing entrails bright"). At this point in British history the French ragout and fricassee, and the Olio (derived from the Spanish Olla Podrida) were firmly established as popular (if foreign) dishes in Britain. However, many people considered them effete and foreign. * Note that as I was unable to obtain an adult sheep rumen, I used a rumen from a smaller animal that held about 1.5 litres.